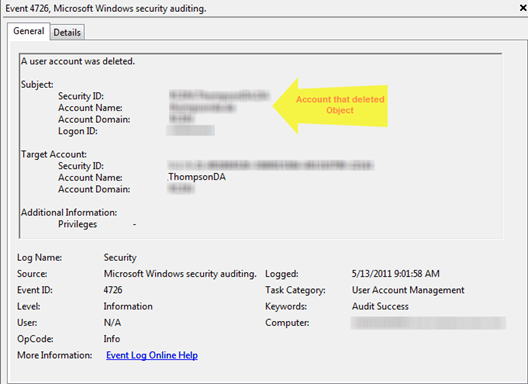 When an object is deleted in AD (2008R2 with recycle Bin installed), that object is marked as being deleted and moved to a special OU. You can find this object using Active Directory for Windows PowerShell. This shows that the object was deleted, but not a lot more. So to get more information on the object we can look at the replication information. Then by looking at the isDeleted attribute, we can use the date time stamp to see when the object was deleted and the Originating DSA to see what DC the object was deleted on. By looking at Ver you can tell how many times this attribute has been changed In this case, Once, when the object was deleted. If you undelete this it will change to 2. By looking in the event logs on the Originating DSA we can see the events about this object. This is assuming that you have auditing enabled. To Audit changes to AD need to set “directory service changes” to enabled (you should do this on all the DCs). 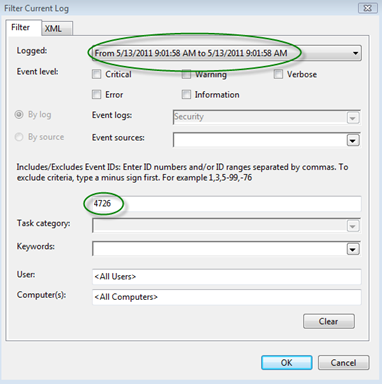 Look in the security events for the Event ID you are looking for and during the time when the event happened.